The foundation of Indian culture is built on the twin pillars of respecting the forces of nature and living in harmony with it.This is also the essence of what Environment Education’s(hereafter, EE) objectives are in my understanding. The need for environmental issues to form a separate entity for study arose, when sciences and social sciences lost their educational goals to competitive examinations. The vicelike grip of exams is negatively impacting EE and neutralising the values achieved by it.The dominance of man-made non-biodegradable materials in our life styles has accelerated the biodegradation of values, and disrespect for nature, and made us forget the need to live in harmony with nature. Contributing to this, to an extent, is the dominance of western science. Its paradigm dictated by empirical analyses and narrow outlooks has left a trail of environmental disaster – a complete apathy for respect to nature except in a very superficial way. We need to educate young minds on issues that are deep and profound. We need to rediscover the phenomenon of ‘sacredness’ through environment education, which is a vital arm of value education, which I would venture to put as THE Value Education. This paper presents some suggestions for making environment education effective in achieving its goals that lie in the affective domain of education, ie in realizing certain values that I would like to term, Rediscovering the Sacred. Observations arising out of various curriculum designs and teacher training programmes in science and environment education, at several schools across the country. ( Ref: Bibliogrpahy). 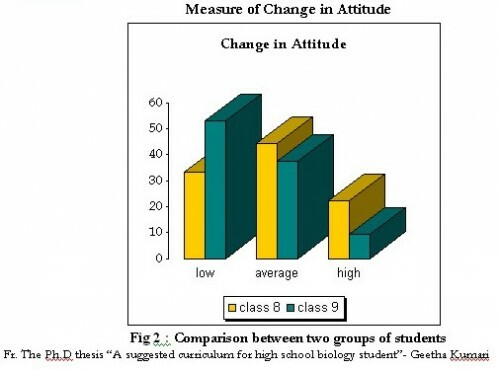 Research findings from the author’s work for her PhD thesis on a biology curriculum for high school students. Suggestions for changes in the syllabus to make its transaction more interactive and interesting. Some suggestions for meaningful assessment and purposeful evaluation. The NCERT-designed curriculum for Class 3 is used as an example for assessment. The document with the accompanying syllabus produced by NCERT has been used for this purpose. 1.1 = 16 ; 1.2 = 14 ; 1.3 = 9 & 1.4 =17. This is a total of 56 concepts. Even if one overlooks the several learning expectations and uses a very modest and superficial count there are still at least 150 -175 concepts that a child of Class 3 is expected to learn. Where is the time? Observations, discussions, field visits and story- telling are some of the suggested activities. How are these activities to be carried out? Each teacher has to deal with 40-50 students and is given a duration of 5 periods/week, 40 minutes / period for her subject. Is it realistic to expect activities and outcomes such as , “Exploring children’s ideas of crawling animals, flyers and insects through observation, of ants, flies, spiders, crickets, cockroaches, earthworms, lizards and other animals OR Sensitivity to the old and physically challenged; blindfold act, visiting any local institution that deals with the blind or any other institution” (NCERT- 2005)? There is simply no time even if the teacher is interested and has the ability to design creative work. It is not as if the curriculum designers are not aware of these problems. The points raised in this paper is nothing new. Then why have curriculum planners not made provisions for the difficult situation faced by teachers? Is there a solution? Based on work done in earlier years, and the recent work at a school in Madurai I say with certainty that there are solutions- more than one. A group of science teachers during a training session could not point out the position of kidneys in their body. Worse still, many of them who were mothers did not know the location of the uterus. The ICSE school board conducts examinations where as the CBSE and the State boards evaluate projects. In both these areas the teachers are floundering. Examination reduces all concepts to facts that can then be remembered, effectively erasing out the possibility of developing sensitivity towards environmental issues. The CBSE and State boards expect students to learn through projects and activities. Like the science practical classes these two excellent methodologies have also been reduced to a farce. Most projects are done by parents. Projects that are so good for learning issues related to environment pose serious problems for teachers because they have hardly done any enquiry based work. Most teachers with whom I have had an opportunity to interact could not give me a correct definition for environment. Most schools have biology or geography teachers handling EE and depending upon the teacher’s subject proficiency, EE becomes an extension of a biology or geography lesson. In a village school, there was a walk through the streets with children raising slogans against littering and the need to reduce plastic. The teachers accompanying the children were seen happily littering the streets! Does this mean that these teachers cannot change? Certainly not! So what prevents this from happening? Lack of ownership for the process of teaching –learning. A syllabus made somewhere by some people, not explained to them by the school except to say teach what is in the text book and make sure the children get good marks, has no real significance for teachers. In short, lack of support and direction, time and resources. Many of them when given the opportunity to express themselves, contribute and work independently during the training period exhibited remarkable insight and possessed energy and motivation for creative work. Teachers when encouraged and empowered with certain empathy for their difficulties could then become a powerful force in creating environmental awareness. Expectations of The School Board : This is a mixed area. While certain school boards are flexible in their approach to dealing with what must be learnt at every stage and are willing to experiment, many state board are rather rigid in their expectations. The Tamilnadu State Board is very particular about what the students learn and how much. They conduct an external examination even at the end of class 4.There are periodic supervisions by Govt officials and the teacher has very little space for creativity. Relationship and sensitivity are learnt from one another. When the supervisors are traditional, and authoritative, the teacher too accepts that as a model to follow in their classrooms. The School’s philosophy : The teacher is a small cog albeit the most important one in the wheel called education.Where ever the school management team consisting of the principal and others have taken a liberal view of education, laid a philosophical basis for the learning process, attempted to empower teachers, the wheel has moved smoothly ; there has always been a blossoming of the mind. Several schools in our country have been able to conduct a meaningful programme in environment education. The schools run by Krishnamurti Foundation of India, Aurobindo Ashram, Shantiniketan, David Horseborough’s disciples, and TVS , have done some good work in this field. Commendable work is being done by several NGOs and individuals but these numbers are too few in a vast country like ours.The voice of teachers and educators are generally silent in most parts. 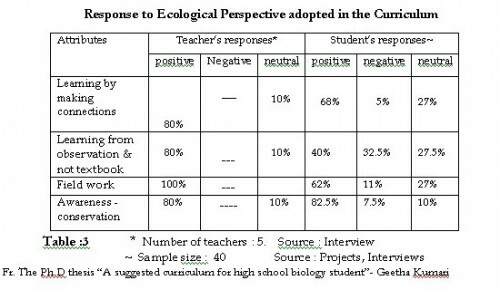 Biology teachers during workshops have always felt that there was ample scope for developing sensitivity to biodiversity issues through a meaningful biology curriculum. Biodiversity is an important topic in Environment Education. Does the syllabus or class time given, allow you to take students outside for observations,? Do you take your students outside for teaching? Do you hesitate to take the children out because of class indiscipline ? Do you hesitate to take children outside due to lack of time? that they will be able to see in their environment? rocks, minerals, erosions in your environment? can help you identify them? your time that you can use for corrections? introduced you to nature study? History Society , World Wide Fund for Nature, Geological society of India? Fr. The Ph.D thesis “A suggested curriculum for high school biology students”- Geetha Kumari. The responses from teachers very clearly show that time is a restraining factor.50% of teachers have said that the syllabus does not permit time for outdoor work. Similarly 70% of teachers have given lack of time as the most important factor for not taking students for outdoor work. If this is the situation for a biology syllabus then how can environment education be able to achieve its goals? How many experiences would a teacher be able to provide for the students, given the big hurdle posed by lack of time and excessive concepts to be learnt? Another important emerging from their responses is the lack of in-service training in the vital area of biodiversity. Most teachers in their student life have learnt from text books and to expect them to do field work in biodiversity related area would not be right.55% of them indicated that they have had no in-service training in the area of nature-study and taken with the 24.6% who have not responded it is an area worthy of review. A third point is one of attitude combined with lack of time. Nearly 45% seem to believe that the effort to take students out would mean missing out on time that could be used for corrections. Given this situation it would be difficult for the EE curriculum be effective in achieving it’s goals in its present formulation. What are the alternatives available? 2.3 Literature Survey :There is ample evidence from across the globe for the need to have an interactive EE if we are to develop sensitivity and awareness amongst children. And for an EE programme to be interactive, methodologies used would have to be field work, visits and outdoor programmes. Subbarini,S.Mohammad (1993) from Jordan talks about Biocentrism being the Islamic approach to environemental ethics. He quotes from Prophet Mohammad’s Peace Be Upon Him and its implications for EE. Ballantyne,RR (1994) from Australia explains how interpretive centres, museums and heritage sites are increasingly being used by teachers to promote EE aims. Freeman,Claire (1995) from UK in The Changing nature of Children’s Environmental Experience, raises concerns over the shrinking realm of outdoor play. He laments how children are becoming increasingly alienated from the nature particularly for play and thereby not experiencing the exploration of natural environment..
Ballantyne, RR (1995) from Australia, in his paper Environmental Teacher Education describes problems confronting teacher educators as they attempt to provided teachers with professional training in the area of Environment education. Buchan,.D.Graeme (2000) from New Zealand in his paper Obstacles to effective Environmental education analyses the main conceptual, attitudinal and societal factors which obstruct ‘effective’ EE. 2.4 Suggestions for modification and alterations in the curriculum: The suggestions given here are based upon the work done by the author (for details see Reference), Literature on curriculum for EE seen in several countries and the new curriculum designed at Lakshmi TVS Matriculation Higher Secondary School, Madurai. The school represents the typical situation seen in most schools, the difference being that the philosophy of the school was child-centric and had the guidance of an extremely creative Chairperson who was also the Chairman of the TVS group in Madurai. Ms.Shobhana, the chairperson felt the need for an interactive, environment- based curriculum; one contextual to the learners, facilitating the development of cognitive skills in students and helping them become life-long learners. Evidence of how school’s philosophy is important for realizing aims. Some of the issues that need to be taken into consideration before designing the curriculum are as follows. These are being mentioned here as the structure of the existing curriculum is seem to have not addressed these needs. The document or the syllabus (Syllabus for classes at the elementary level,102. NCERT- 2005) has no reference to some of the issues raised here. The curriculum has to be suitable for large numbers of students in each class. The teachers would have to be trained for curriculum transaction in its entirety. The resources available for the students -from the environment ,in their schools, neighbhourhood etc- have to be taken into account. The needs of the learners. 3. THE CURRICULUM DESIGN: Curriculum is a comprehensive road map to education. It is often interpreted in the narrower sense of a syllabus. Hence most curriculum plans in India have lists of topics, concepts, resources and activities. This is what we see happening at the NCERT curriculum too; or to be politically correct , it appears to be so when one peruses the documents produced by this institution. The learning outcomes from such an exercise would be eminently clear to those who framed it, but to a person from Kanyakumari or Arunachal Pradesh or Bhuj it would not make the same sense. In fact text book writers make it even more difficult. Some of them give answers to questions that figure in the first column of the syllabus. Those questions that are meant as hints for discussions to facilitate learning are completely lost by the time the text book reaches the teacher. Very rarely is a teacher given a copy of the syllabus as documented by the NCERT. Teachers merely get text books and teach what they find there. Even in a place like Mumbai school teachers upto class 8 had not seen any of the documents prepared at the cental level in connection with the syllabus. Some of the teachers of examining going classes take a look at it. They do this to make sure that the necessary topics have been completed. They do not dwell on the perspectives or learning outcomes of their students in the cognitive and affective domains. At TVS we found that a class 1 child was expected to learn the correct spelling of the word ‘Environment’. There was a staggering number of new vocabulary that needed to be learnt. Whether it was at all needed, possible and whether learning those words was the most important outcome never figured as an issue for the teachers. Sadly even the word ‘environment ’is pronounced wrongly by most teachers across the country! 1. Reduce the number of concepts. Let there be for every unit not more than 3 concepts to be learnt. This means that we consciously ensure the learning of these concepts and evaluate the extent of learning; at the same time not shutting the door to students who may want to learn more. This way the onus of learning is on the child. If the methodology is interesting a child will learn beyond our expectation. 2. Make a clear distinction between concepts and facts that need to be learnt. Often these two are used in a mixed manner under the heading ‘concepts’. For eg. The concept to be learnt ( ex from class 3, Unit 1.2)- exploring the idea of a plant. Details of what a child explores( colour, shape) is facts and not concepts. Those details are concepts for children of a higher grade. By adding details we invite study of facts. Let the facts about shape, colour,a aroma or something more arise from the child’s experiences. It would make no difference to a child if some facts learnt in one place is not learnt by children from another part of the country. All children would have the opportunity to explore what constitutes a plant and therein lies the key to development of learning skills. By adding details which is pounced upon by textbook writers, makes teaching a difficult job for teachers. 3.Avoid repetition of topics and concepts. Class VI and VII EE syllabus has similar concepts on air water and soil that continue to dominate at various other levels too.Similarly class VIII & IX have an overdose of ecosystems which start as forests etc in classes VII & VIII. These are topics that are also learnt in science and geography and taken together would rapidly lead to boredom for students. One of the complaints I have heard from teachers whether they are from Mumbai. Bhubhaneswar, Madurai or Delhi is about repetition of topics especially plants, water, soil, air, food chain to mention a few. Clarity of concepts to be learnt, reduction of their numbers at all levels is an imperative to make EE worthwhile. I present research findings for anew curriculum in biology that had an ecological perspective and laid emphasis on outdoor study. Both the students and teachers welcomed the experience. 4.Change the format of the presentation and details of the curriculum and make it more explicit in what is expected as learning outcomes. Rather than suggesting activities, suggest clearly the learning outcomes. A list of vocabulary, skills that need to be mastered at each level is what the curriculum should have. The activities, examples should be left to the teacher to decide based on what is available in the students’ environment. 5. Let there be greater involvement of teachers in curriculum design. Evolve a decentralised programme for curriculum design process. It is high time that more teachers across the country are included in the curriculum formulation process. Teachers have a clear idea of the time required, appropriateness of content and extent of age-related abilities of children. Their inputs should be given greater preference than those who are associated with higher institutions of learning or are administrators in the various departments of education. Currently the ratio of teacher: professors & administrators in a curriculum committee is imbalanced. I would suggest a 75 :25 ratio of the two groups as ideal for a committee. This number arises from years of teaching science and biology syllabi that have been periodically changed by various professors of biology, with very little explanations given for the rationale of change. The second suggestion I have is that before a syllabus is finalized it should be sent to regional centres who will in turn have it widely distributed for feedback. Feedback should be critically examined and the curriculum finally decided. Indeed a long drawn out process, but when the processes adopted so far have not worked to achieve their goals, then a complete overhaul becomes necessary. 6. Alter the number of subjects studied at each class : Merely changing topics would perhaps be the first step. Accompanying this could also be a change in the subjects learnt at each class. Environment education could replace science and social studies at some levels. At high school level EE could become a compulsory subject that would be evaluated at the end of the academic year. At senior secondary and upwards principles of EnV Science needs to be infused with other subjects. This is what I would like to suggest and these are based on what the theme paper of NCF 2005 articulates for Environment education. At the High school stage Environment education should replace social studies as a compulsory subject. The emphasis could be on concepts related to sustainability, citizenship and peace. At each stage and for every class, clear statements of minimum learning outcomes that can be evaluated should be unambiguously stated. Cognitive skills should be given importance during evaluation than mere facts. Concepts be framed such that there is a gradual movement in complexity as well as a back and forth movement between them. Projects done must be assessed for their ability to develop a value system, awareness and sensitivity to environment issues in students. This indeed is the most tricky part. Community based projects made compulsory for transaction of 50% of the syllabus from classes 8 onwards. NCERT must undertake to evaluate textbooks produced to ensure that objectives of the curriculum are not lost and teachers get the opportunity to use good resources. Assessing students in the affective domain needs to be done objectively, for which clear guidelines must be evolved. Teacher training programmes evolved to develop core groups of teachers who can share and train others. This is important prior to introduction of a new curriculum. Can that be done if the number of subjects and topics are for ever increased? My research on a biology curriculum for high school students that emphasized concepts, not facts and had an ecological perspective was precisely an attempt to realize what has been quoted above. It was met with a lot of skepticism to begin with. But the two schools that taught the curriculum noticed that reduction in concepts did not reduce quality. I present below my research findings in support of my statement that a reduction in number of topics to be learnt will be an enjoyable experience for both teachers and students. Biological concepts were learnt well from field work, projects and discussions. I hope the data presented in this paper will motivate more research in this area and convince the community of educators to start the process of reframing the environment education curriculum and reduce the burden of learning and teaching currently being suffered by adults and children alike. 3. A multi-pronged strategy of EE, science and social studies alternating as subjects of study as suggested in this paper. Barker, Susan, Slingsby, David and Tilling, Steve. 2002. Teaching biology outside the classroom: Is it Heading for Extinction? Field Studies Council of British Ecological Society. Geetha Iyer 2002 part of 3 Member group to Design Environment Application course for the ICSE board. Geetha Iyer. 2001. Understanding Environmental issues related to Water. Environement Science curriculum for class 7 students of The School, KFI, Chennai. Geetha Iyer. 1999. Towards an Earth-Centered Curriculum. Journal of The Krishnamurti Schools, No.3 March 1999. Geetha Iyer. 1994-1999. Soil and moisture conservation. Environment Education curriculum for class 11 General studies course of ISC students, Rishi Valley School. Ministry of Human Resource Development.1993. National Advisory Committee, Learning without burden. New Delhi: Government of India. National Council of Educational Research and Training. 2005. National curriculum Framework 2005. Government of India, New Delhi. 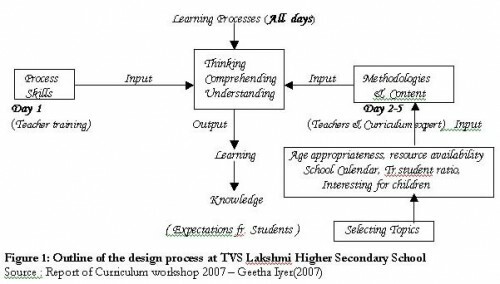 V.Geetha Kumari (alias Geetha Iyer) 2007 .A suggested curriculum for High School biology student.Ph.D Dissertation. University of Madras, Chennai. Please intruduce me, my name is Zahriani, I live in Banda Aceh (Top of Sumatra Island),Indonesia. I am a postgraduate student in Magister Biology Education Syiah Kuala University,Banda Aceh,Indonesia. REDISCOVER THE SACRED” I like the article for my research,but I cannot download it. I would very happy if you could send the article in my email address. I say thank you verry much for your kindness.